The shift schedule defines when shifts are active and able to receive notifications. Use different shifts to represent your team's real-world schedule and to create on-call coverage during off-duty hours. If your group is configured to use site holidays, you can create shifts that occur only on holidays. For more information about creating a holiday shift, see Schedule holiday shifts. Once you have created the shift schedule, you may want to configure shifts to use escalations and rotations. These allow the first shift members time to respond to a notification before the remaining shift members are notified, thereby reducing the overall number of notifications sent to the group. For more information about configuring the escalation timeline, see Escalate alerts within a shift. For more information about defining shift rotations, see Rotate positions within a shift. You can create a new empty shift or you can copy an existing shift to reuse its members and escalation timeline. The group interface allows you to delete entire shifts or a single occurrence of a shift, which may help you adjust a shift schedule around special events. You can add a shift to the schedule by clicking the Add Shift button from any of the groups tabs. When you add a shift you can specify the start and duration of the shift, and how often it recurs. This shift is associated with your time zone in xMatters (for example, if your time zone is '(UTC-0800) US/Pacific', that's also the time zone of the shift). You can also add a shift by drawing it directly on the calendar. For more information about adding a shift in the calendar view, see Add a shift by drawing on the calendar. Click the Add Shift button. Type the name of the shift in the Name field, and an optional description in the Description field. To set the duration of the first, or original shift, click in the Start and End date and time fields to adjust the date and time the shift starts and ends. You cannot choose a start date earlier than the current date. The Create Shift screen will indicate if you have specified a shift that is longer than 24 hours. Adjust the shift recurrence settings for your shift series. For more information about working with shift recurrence options, see Advanced shift recurrence options. The shift you just created does not contain any members. To add members to your shift and adjust the escalation timeline, see Escalate alerts within a shift. Copying a shift allows you to create a new shift that has the same members, escalations, and rotation rules as the original shift. This enables you to more easily build out the shift schedule without having to re-enter the same member information every time you create a new shift. When you copy an active shift, the newly-created shift includes the same members, escalation rules, and rotation rules (for event- or schedule-based rotations) as the original shift, and is active all the time. Shift-based rotations are based on the newly-created shift (not the original shift). If you copy an unscheduled (expired) shift, xMatters creates a new default shift that has the same members but does not copy other information. Locate the shift you want to replicate. The Shifts tab contains either a single list of active shifts, or tabs for Scheduled and Unscheduled Shifts. You can copy active scheduled shifts and unscheduled shifts. Type a name and description for the shift, and then click Copy Shift. xMatters creates a new shift. You can delete an entire shift series to remove it from the group. When this happens, any members that do not belong to other shifts are also removed from the group. Locate the shift you want to delete, and then click the gear icon next to its details in the left pane. Locate the shift in the calendar view and click the shift. In the pop-up window that appears, click Delete Series. You can delete a single occurrence of a shift from a group's schedule. Deleting an occurrence of a shift does not affect the rest of the shift or change its recurrence schedule. On a group's Calendar tab, locate the shift containing the occurrence you want to delete. Click the occurrence to display its details, and then click Delete Occurrence. Click Delete to delete the occurrence. If the time at which a deleted shift was originally scheduled to occur has not already passed, you can restore a previously canceled shift. On the Shifts tab, locate the shift from which the occurrence was deleted. Click the Settings menu for that shift (the gear icon), and select Restore. 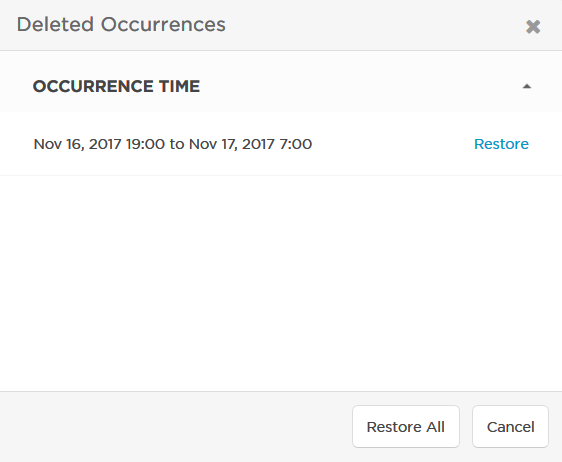 In the Deleted Occurrences dialog box, click Restore next the shifts you want to restore, or click Restore All to restore all of the deleted occurrences. You can immediately restore a deleted occurrence by clicking Restore in the confirmation message that appears at the top of the screen after you delete the occurrence. 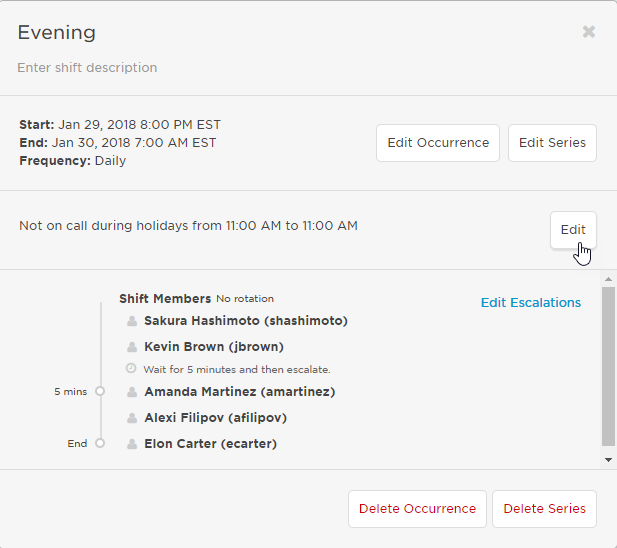 You can edit a shift name and description to make it easier to understand how xMatters shifts correspond to your organization's shift schedule. The group interface allows you to modify a shift name and description from the shifts tab. You can also modify the shift name (but not the description) from the calendar tab. Click the shift that you want to edit. To edit the shift name, click the shift name, and then type a new name. To edit the shift description, click the shift description, and then type a new description. On the Calendar tab, click the shift that you want to edit. In the displayed dialog, click the shift name and type the new name of the shift. The shift time frame and recurrence options define when a shift is active and can receive notifications. The shift's recurrence options are based on common calendar applications you may already be familiar with; for example, you could define a shift to recur on weekend days, weekly on Fridays, on the 15th of the month, and so on. Once you have created a shift you can adjust its start and end times and repeating pattern to reflect your organization's real-world shift schedule. Locate the shift on the calendar, and then click the shift area. To edit the shift duration, click Edit Occurrence. The Shift Details dialog window opens. To adjust the start time of the shift, click the calendar icon in the Start Date area, and then select the date and time at which the shift starts. To adjust the end time of the shift, click the calendar icon in the End Date area, and then select the date and time at which the shift ends. Verify the shift start and end date. Default shifts end at 00:00 on the day after the start date; if you are adjusting a default you may need to adjust the day as well as the time. Locate the shift you want to adjust, and then click the gear icon next to its details in the left pane. To adjust the start time of the shift, click the calendar icon in the Shift Start area, and then select the date and time at which the shift starts. You cannot edit the Shift Start to a start date earlier than the current date. Verify the shift start and end date. Default shifts end at 00:00 on the day after the start date; if you are adjusting a default shift you may need to adjust the day as well as the time. Changes to the shift duration will apply to the entire series. You can change the duration of a single shift occurrence from the calendar tab. You can configure a shift to recur on a regular basis that reflects your organization's shift schedule. This enables you to create a single, repeating shift to represent a real-world shift instead of creating multiple one-time shifts. xMatters provides many options for defining shift recurrences. For more information about working with these advanced recurrence options, see Advanced shift recurrence options. To edit the shift recurrence, click Edit Series. The Edit Series dialog opens. Adjust the values in the Edit Series dialog to reflect your shift options. For more information about working with shift recurrence options, see Advanced shift recurrence options. 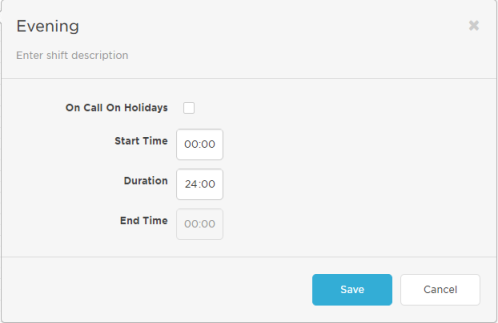 You can configure shifts to be off duty on holidays such as civic holidays and special events. When a shift is not on call on holidays, shift members do not receive notifications sent on holidays during the specified holiday hours. After you configure a shift to be off-duty on holidays, you may want to create a separate holiday shift to handle holiday notifications. To learn more about how to configure group holidays, see Schedule holiday shifts. Locate the shift on the calendar and click it. In the pop-up dialog box, in the area that describes the current holiday settings, click Edit. Holiday information is displayed only when the group is configured to use site holidays. For more information about setting site holidays for a group, see Site to use for holidays. Clear the On Call On Holidays check box. To ensure the shift remains off-duty for the entire duration of the holiday, set the start time to 00:00 and set the duration to 24:00. You can set a different start time and duration to make the shift off-duty during part of a holiday but remain active for all of its regular schedule that is not within those hours. For example, if you have a shift that is regularly on-duty from 8 AM to 5 PM and you set it to be off duty on holidays from 8 AM to noon, then the shift will still be on-duty on holidays from noon to 5 PM. Once you have created the shift schedule, you may want to review it to see if there are gaps in coverage or shifts without assigned members. This helps you ensure that somebody will receive notifications regardless of when they are sent. You might also want to check out how DST changes affect your calendar. Empty shifts do not contain any members. When a notification is sent to a group with an empty shift, there are no members assigned to receive the notification (members of other active shifts may still receive the notification). Shifts may be empty when they are initially created or may become empty when you adjust the roster. 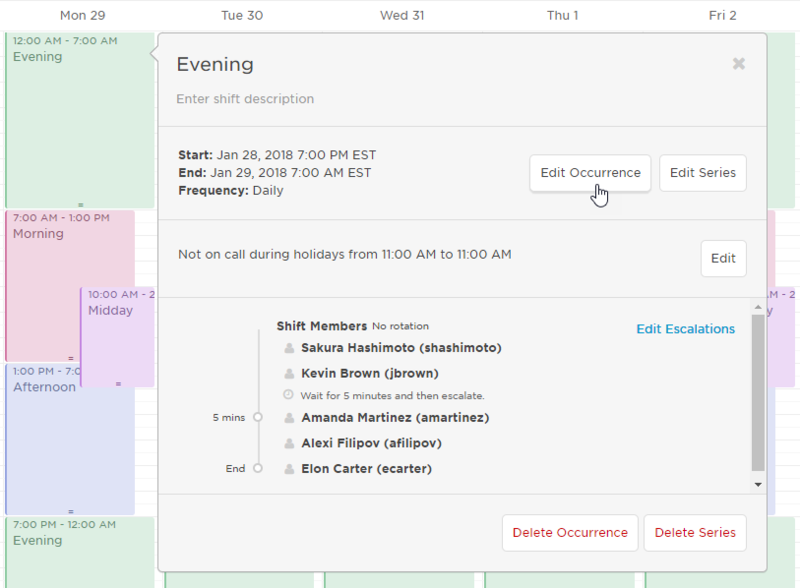 The calendar displays empty shifts with a dashed border, allowing you to quickly identify shifts without any members and adjust the roster so that their corresponding time frame is covered. 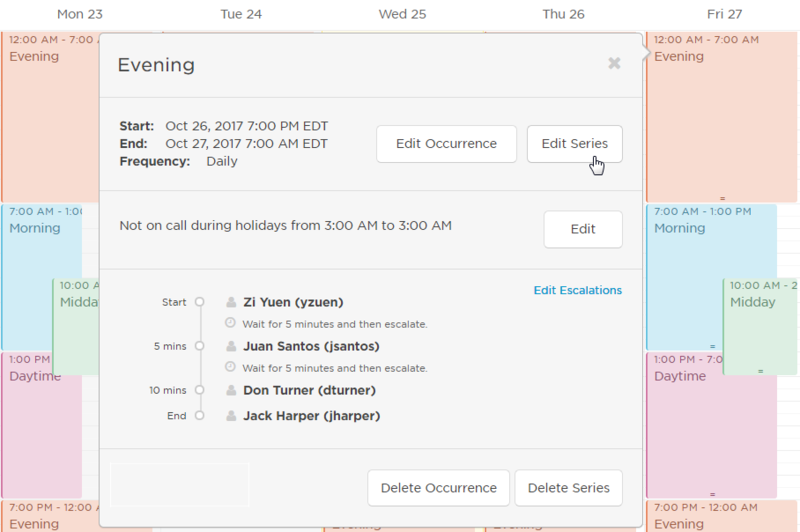 The calendar view allows you to identify empty areas that are not covered by any shift. If a notification is sent to a group at a time when it does not have an active shift, group members are unable to receive the notification. 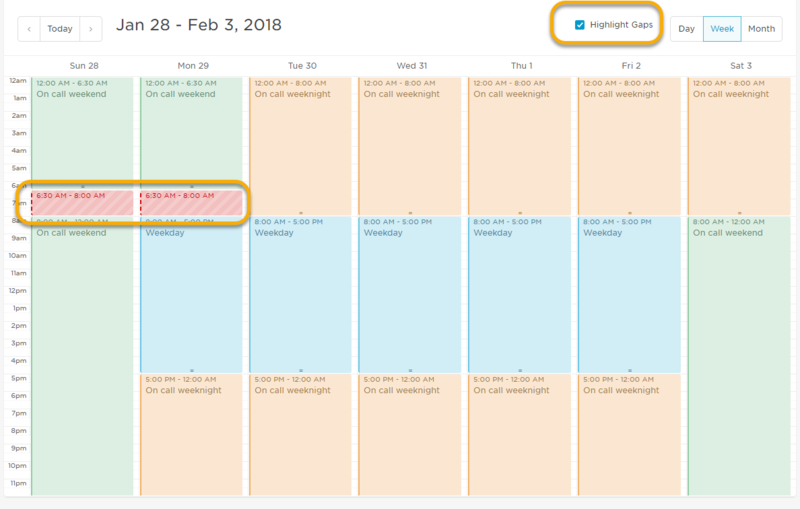 When the Highlight Gaps check box is selected, gaps in the calendar are displayed with a dashed border and red striped background. You can then adjust the surrounding shifts to cover this gap or click the highlighted area to add a new shift that covers the missing time. 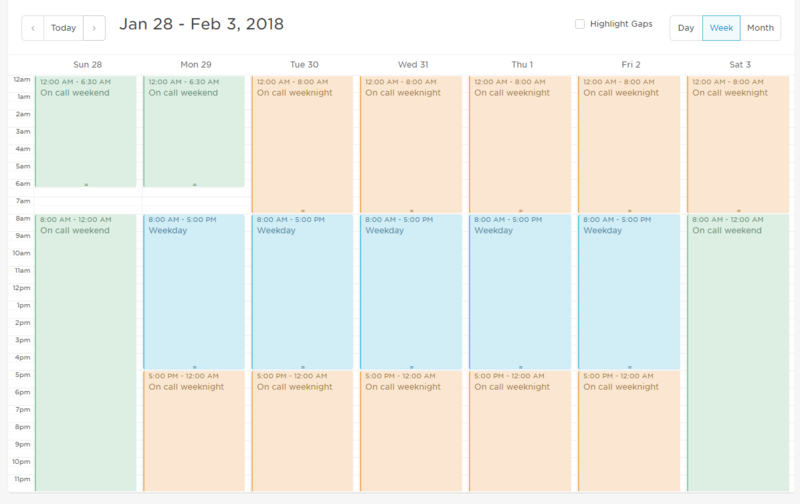 The following image displays the weekly view of a calendar that contains several shifts. There is a gap in coverage on Sunday and Monday. Selecting the Highlight Gaps check box highlights the gaps in the calendar coverage. Select the Highlight Gaps check box. 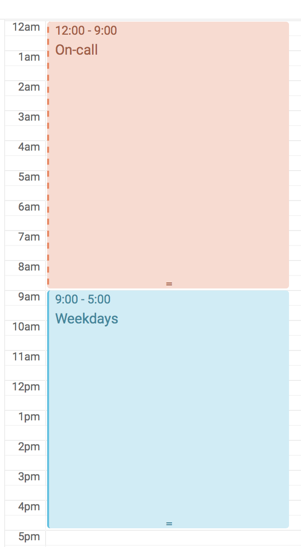 Timeframes that are not covered by a shift are displayed with a dashed border and a red diagonally-striped background. Click a highlighted are to create a shift that covers the empty time frame. There are some unique shift types in xMatters that are used differently than standard shifts. Holiday shifts are automatically scheduled for days that are defined as site holidays. Unscheduled shifts are shifts that have already completed but are left in the system so they may be viewed or copied. For more about creating a holiday shift, see Schedule holiday shifts. Unscheduled shifts are shifts that have completed and will never occur again. A shift becomes unscheduled after midnight on the last day it occurs. If your group contains one or more unscheduled shifts, the Shifts tab displays an option to view either a list of scheduled or unscheduled shifts. You can edit an unscheduled shift to reschedule it again in the future, or you can copy an unscheduled shift to create a new scheduled shift with a 24x7 time frame using the same group membership. You can also delete unscheduled shifts to remove them from the list of unscheduled shifts. Copying and deleting unscheduled shifts use the same workflow as regular shifts. For more information on copying or deleting shifts, see Copy a shift or Delete a shift.